Even before he graduated from law school, Matt knew he wanted to dedicate his career to criminal and drunk driving defense. While attending Detroit Mercy School of Law, he completed internships with circuit court judges, the Portage County (Wisconsin) District Attorney’s Office, and the State Appellate Defender’s Office. He gained valuable experience, working on numerous homicide, criminal and drunk driving cases. Due to skill and proficiency beyond his years of experience, he was awarded the opportunity to act as lead attorney in a number of drunk driving cases during this time. Matt's hard work & legal acumen also resulted in his receiving the highest grade in his entire law school class for legal writing, and another award for "Excellent Achievement" in the study of applied legal theory and analysis. In December of 2008, Matt began his career at a small firm in the Appleton area, where he worked exclusively on criminal and drunk driving cases. During this time, he solidified his decision to devote his law career to defending people charged with drunk driving offenses. 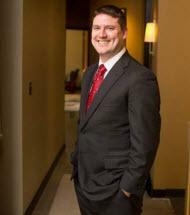 In 2009, he opened the only law firm in Green Bay, Wisconsin that focused entirely on DUI defense. Matt quickly developed a reputation in the legal community for effective, aggressive, and innovative DUI representation, with numerous favorable outcomes for his clients. Always keeping an eye out for top talent, Melowski & Associates soon invited Matt to become a part of their team and he has been an outstanding addition to the firm. In fact, from 2013 until the present, Matt has consistently been recognized as a Rising Star in DUI defense in an annual list of the State's top attorneys published by Thomson Reuters. When not practicing law, Matt, a native of Canada, enjoys spending time with his wife and children, coaching youth hockey, and playing hockey. Recognized as a Rising Star in DUI defense in the December 2013 edition of Milwaukee Magazine.